Otherwise known as Echoes of the Baker. Seriously, for all the right reasons, this could easily have been an episode featuring Tom Baker as The Doctor with his trusty screaming, but supportive, companion Sarah-Jane Smith. An undersea base – once a military base in a village drowned by a broken dam – has been reopened because of the potential for profit. It would appear fuel reserves under the valley make a visit by a survey team worthwhile. Alas, they come across an alien spaceship containing an indecipherable message – and things go wrong from there. Ghosts! Spirits of the dead, I tell you! In short order, the ‘base under siege’ plot kicks in, with The Doctor and Clara as trapped as a crew – though, perhaps our time travels entrapment comes down to curiosity and the need for adventure more than physical restriction. From the point of view of tie-in novels, the gap between here and the last episode must be huge. Clara seems positively buzzing on the potential for more excitement and adventure – which, upon arrival at the base, a gloomy and silent corridor doesn’t seem to offer. However, once the traveller come face to face with the ghosts and then the crew, the excitement ramps up enough for Clara to stay. Well, the gloom, claustrophobia, detective-work monologuing, and the sense of the alien about The Doctor harken back to Tom Baker’s turn as the Time Lord. Ghosts and mystery clash with technology and profiteering. Clara has clearly set herself a goal of giving The Doctor a better bedside manner, providing him with convenient flashcards with calming and reassuring statements – which he proceeds to delivery in the most mechanical and unconvincing way. Lovely stuff. Yes, we have been in the siege situation before. However, isn’t there some old truth about only a finite number of plots existing, so you have to recycle them eventually. Nothing wrong with that. I personally love the opportunity to run around the same lengths of a dimly-lit corridor from different angles time and time again. A curve, a junction and a couple of doorways – and voila! A whole base to have fun in. You get Alien, Aliens and Alien3 thrown in for good measure, with the crew hunted, the gobby military personnel, the profiteering rep of the company with only his interests in mind, and the attempt to lure the adversary into a trap. Thankfully we pulled short of emulating Alien Resurrection – perhaps with The Doctor playing an over-enthusiastic and brutal game of tiddly-winks. 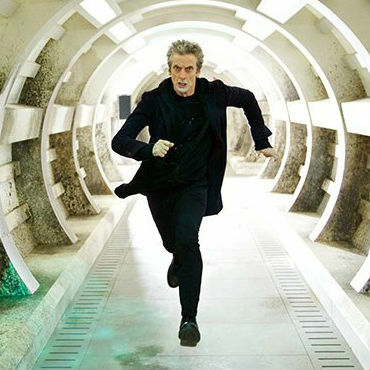 The episode just felt packed with nice touches and gentles nods at firm favourites – the TARDIS uneasy and the sound of the cloister bell, The Doctor quite forward about who he likes and who he has no time for, the brainstorming session for ideas where The Doctor just needs people to bounce his own ideas off, the House-style realisation that what The Doctor thought was completely wrong and suddenly the clues all fall into place. And UNIT. The psychic paper flashes a UNIT ID and one of the personnel in the station has heard of The Doctor. No need for the traveller to worry they lack the credentials to take charge – UNIT still pack some clout and they’re not to be argued with. Oh, and interesting to see the reuse of a known quantity in the Tivolian ghost. David Walliams played the Tivolian Gibbis in The God Complex – so we have a baseline understanding (assuming you’ve seen the episode) that they’re meek and pathetic by way of a defence mechanism. As The Doctor muses, what would turn such a cowardly alien into such a menacing and psychotic ghost? I loved it and I can’t wait to see the next episode. The cliff-hanger ending was excellent… and simply leaves me wanting more, more, more. This entry was posted in Current Doctor, Twelfth Doctor and tagged base under siege, Clara Oswald, Peter Capaldi, Tom Baker, Under the Lake on October 4, 2015 by Paul B.